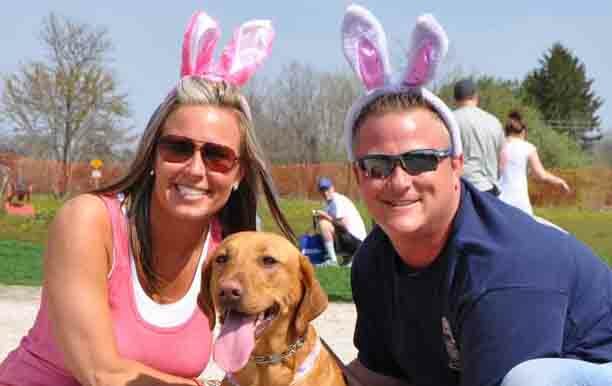 The annual “Hugs for Hounds Easter Egg Hunt” will get cracking on Saturday, April 20, at Hammel Woods at 23435 West Black Road, Shorewood. HSP will have a booth and hopefully a few dogs to promote adoptions. .
Thousands of plastic eggs filled with doggy treats and prizes will be located in the grass in a fenced-off area within the dog park at Hammel Woods – DuPage River Access, located on Black Road, east of Route 59. Once Fido’s nose touches an egg, the dog’s owner can place it into a basket or bag. Bring a basket to collect the eggs, and your dollars to participate in a special raffle for dog-themed Easter baskets. Raffle tickets are $1 each or 6 for $5. A variety of awards will also be given at the event, including one for best Easter outfit. Entry fee proceeds will be donated toward the care, handling and training of the Forest Preserve police K-9, Jullo. You can REGISTER in advance or the day of the event.